Much of the utility of the Jeep is due to the extra equipment which has been designed to adapt it for farming and diversified occupations and industries. The maintenance and use of this equipment is outlined in the following paragraphs. The governor is a centrifugal type unit which gives precision control of engine speeds. When speed control is not desired it should be disengaged with the twin-pin type clutch No. 1, Fig. 33. Never engage this clutch with the engine running. To operate it pull the cap outward and rotate it ¼ turn in either direction until you feel the two lugs drop into the recesses provided. The governor is engaged when the lugs are in the deeper recesses. The shallow recesses lock it in the disengaged position. 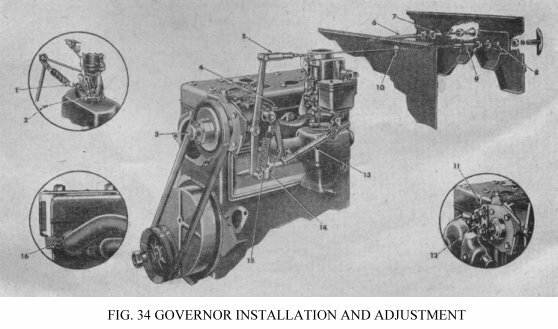 Some governor clutches are controlled by a spring loaded lever mounted at the top of the governor housing the operation of which is obvious. The belt tension may be adjusted by raising or lowering the governor in the slotted mounting holes Fig. 34, No. 11. Keep the pulleys and belt free of dirt and oil. Belt slippage will effect governor operation and a tight belt may cause rapid wear of the governor shaft and bearings. Adjust it to allow 1” depression midway between the pulleys with thumb pressure. The controlled engine speed may be varied with the hand control mounted on the dash. With this control in against the dash, the controlled engine speed is 1000 rpm. The speed is increased 200 rpm. Per notch, as the hand control is pulled out. The top speed is 2600 rpm. In the 9th notch. The hand control is released by turning the handle ¼ turn in either direction. When the governor is to be used, stop the engine, engage the governor clutch and pull the hand throttle fully out to allow the governor to take over engine speed control. When the governor clutch is disengaged, release the hand throttle by ¼ turn in either direction. Mechanical adjustment of speed control is obtained by adjusting the length of hand cable control assembly No. 5, Fig. 34. First check the carburetor throttle rod to make certain the throttle opens and closes fully. Disconnect the accelerator spring and eliminate any bind or stiffness in the throttle connections and carburetor linkage. Free operation of the throttle is necessary to prevent surging of the governor when the engine is placed under load. After checking, reconnect and leave it there. Set the dash hand throttle in the fully open position and leave it there. All the adjustments are made with the throttle in this position. Adjust the length of the spring loaded governor-to-throttle link No. 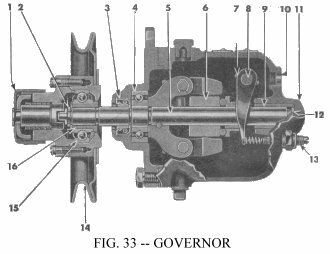 13 to allow exact assembly between the short or lower governor lever and the carburetor throttle lever without moving either lever and with the throttle fully open. The length of the link after adjustment should be approximately 6” between the centres of the ball sockets. Tighten the adjustment lock nut and install the spring loaded governor-to-throttle link. Engage the governor clutch by turning the control on the pulley hub until the pins drop into the deeper recesses. Place the governor hand control, mounted on the instrument panel, in the closed or “IN” position and check to be sure the hand throttle is fully open. Start the engine and allow it to run until operating temperature is reached. The governed engine speed is controlled by the position of the upper or long governor lever. Adjust the yoke No. 5, Fig. 34 on the hand control cable and attach it to the governor arm when the arm is positioned to give an engine speed of 1000rpm. Safely jack up the rear wheels and be sure the front wheel drive is not engaged. When driving the rear wheels in high or direct transmission gear, the speedometer will read 15 mph. at an engine speed of 1000 rpm. In some cases it maybe necessary to adjust the surge screw at the rear of the governor to eliminate surge. Should this be necessary, loosen the lock nut and turn the slotted screw until the engine stops surging when the governor hand control is suddenly operated from low to high speeds then tighten the lock nut. Use care in making this adjustment: should the screw be turned in too far, governor speed control will be lost. Some vehicles are equipped with the Monarch governor. This governor is similar in design and operation to the King Seeley type described above. However, engagement is through a spring loaded lever control mounted at the top of the governor body. To engage the drive unlatch the control lever and allow the spring to carry the engaging clutch forward. When adjusting this governor follow the above instructions in every detail except the adjustment of the spring loaded governor-to-throttle link No. 13. Adjust this link with approximately 1/16” slack or lost motion. No surge adjustment is required or provided with this governor, however this slack or lost motion is provided to cushion any slight irregularities in governor control. Change the oil in the governor at each engine oil change, using the same grade oil used in the engine. Fill it to the level plug opening slowly – do not overfill. 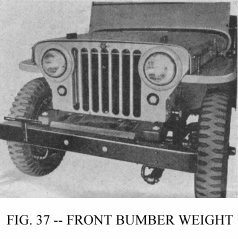 Should any trouble occur which requires disassembly, consult your Willys-Overland Dealer. The complete power take-off consists of three assemblies; the shift unit (mounted on the transfer case), the shaft drive assembly and the pulley drive assembly (mounted at the rear of the vehicle). The rear units are driven through the shaft assembly by a propeller shaft and two universal joints. The assembly, mounted at the rear of the vehicle, is designed to drive trailed equipment or operate belt driven machines. The shaft and pulley speeds conform to SAE standards and are obtained at the maximum torque speed of the engine. For information covering the power take-off shaft and pulley speeds, see the chart on the “Power Take-Off and Vehicle Speeds” page. This assembly, attached to the rear of the transfer case and operated from the transmission main shaft, provides a gear shift for control of the power take-off. The shift assembly is lubricated from the transfer case and no attention is required other than the regular lubrication of the transfer case. Keep the attaching screws tight at all times. Always disengage the clutch when shifting the gear. When using the belt drive, do not attempt the shift until the machine being driven has “coasted” to a stop. The power take-off propeller shaft is tubular and has two universal joints. The joints are enclosed by housings and boots, which contain the lubricant. The torque capacity of the propeller shaft is far greater than that developed by the engine and as there is very little flexing of the joints, this unit will require no attention for the life of the vehicle under normal use other than an inspection at each regular vehicle inspection, to guard against loose companion flange attaching screws or leakage of lubricant at the boots. Should the power take-off be used often for continuous operation, disassemble the joints and repack them with lubricant once each year. The six-splined 1 3/8” power take-off shaft provides a power output to operate trailed equipment. Always use four wheel drive when towing power driven equipment. Selection of the most satisfactory governed engine speed, as well as transmission and transfer case gear shift positions will depend upon the soil conditions and the power required to pull the trailed equipment; also when operating agricultural machines, upon ground and machine speed requirements and crop conditions. When towing power driven farm machines, under average conditions, the most satisfactory operation will be secured by using either No. 5 or No. 6 governor position with both the transmission and transfer case gears in the low range position. This engine speed and gear combination provides a ground speed of from 4 to 4 ½ miles per hour and a power output shaft speed of 535 to 600 rpm. Under extremely heavy crop conditions it may be found that the machine being operated cannot handle the volume of the crop which is cut at this ground speed. To handle the crop, it is necessary to reduce the ground speed without changing the power output shaft speed. This is accomplished by interchanging gears No. 33 and No. 15 as shown in Fig. 35. These two gears form a drive ratio within the power output unit of either 20 to 24 (5 to 6) or 24 to 20 (6 to 5). 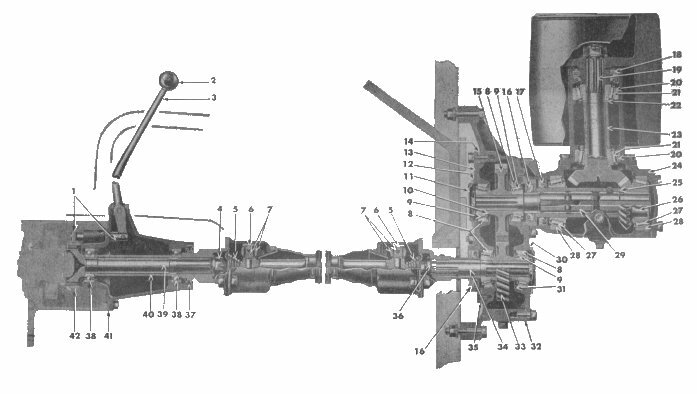 The original factory assembly is made to provide a ratio of 20 to 24 – the 20-tooth gear assembled on the input shaft and the 24-tooth gear on the output shaft as shown in Fig. 35. To interchange the gears, first remove the power take-off assembly from the vehicle and drain the lubricant from the housing. Remove the bearing retaining plate No. 11, Fig. 35. Bend back the lips of the nut locking washer and remove the bearing retaining nut. The cover may then be removed with the bearing assembly. Use care not to lose the shims which are placed between the gear hub and the bearing cone. The gear may be slipped from the shaft through the cover opening. The other gear may be removed in the same manner after removing cover plate. Interchange the gears and reassemble in reverse order with the long side of the gear hub toward the cover opening. Use care that the shims are replaced in the same position relative to the bearings from which they were removed. Do not overlook refilling the housing with lubricant. The speed of the output shaft in relation to the vehicle ground speed is important. To aid in the selection of engine speeds and gear ration positions, refer to the chart on the “Power Take-Off and Vehicle Speeds” page which shows both the shaft and vehicle speeds through the range of governor controlled engine speeds and in all transmission and transfer case gear positions. CAUTION: When the vehicle is reversed, the shaft drive will turn in the reverse direction. Some farm machines will be damaged if reverse driven. When operating trailed equipment, be sure to disengage the power take-off with the shift lever before reversing the vehicle. Being able to reverse some power driven machines is an advantage to aid in freeing the machine should it become clogged in operation. Inspect the power take-off unit periodically and add sufficient lubricant to keep it at filler plug level. Keep the attaching screws tight at all times and the breather or vent free of dirt. When using the shaft drive, always install the shield which is provided for the safety of the operator. The pulley drive assembly, with 8” pulley, is driven through the power take-off shaft. It is held in position with four cap screws and can be quickly removed or installed. Always remove this assembly when it is not in use to avoid damage through accident. When operating the pulley drive assembly use care that the vehicle is correctly aligned so the belt runs at the centre of the pulley. Do not tighten the belt excessively: when too tight, rapid wear of the drive parts of both the machine being driven and pulley drive assembly may occur. If correctly adjusted the hand brake will hold the vehicle when ample drive tension is placed on the belt. The belt pulley drive is operated from the transmission main shaft, giving the same power and speed ratios that are provided by the transmission for the vehicle on the highway. To operate the pulley with the vehicle standing, place the auxiliary (right hand) transfer case lever in the neutral position, designated as “N” in Fig. 3. The nine governor controlled engine speeds in conjunction with the transmission gear shift positions provide a large selection of pulley speeds. Select the governor and transmission gear shift positions that will provide the recommended speed of the machine being driven. Machines driven below this speed will seldom do a satisfactory job while speeds above normal will cause rapid wear and are, in some cases, dangerous. The table on the “Power Take-Off and Vehicle Speeds” page is provided as a guide in selecting the correct control positions to secure the recommended speed. CAUTION: When the belt drive is used, ground the vehicle with a bar or piece of chain so static electricity is dissipated or sparks might cause a fire in dusty or inflammable surroundings. The front pulley drive unit which may be installed at the rear of the power take-off front or shift unit is used to drive compressors, pumps, generators, etc., mounted in the vehicle to the right and behind the drivers seat. The 6” pulley may be wither two or four-grooved for multiple “V”-type belt drives and will deliver up to 23 horsepower. When multiple drive belts are used it is important that each belt carry an equal share of the load. While this type belt had a steel core, some stretching may occur, and should one belt break or become damaged, all should be replaced. Should the belts be removed, mark them to permit reinstallation on the same pulleys from which they were originally removed. Do not tighten the belts excessively. Both front and rear canvas body enclosures are available. The front enclosure may be installed independently and the side curtains which are mounted on steel frames are hinged to open as doors. The hinge pins may be lifted from sockets to allow quick removal of the doors. The rear enclosure is attached to the front top and is provided with curtain lights in each side. A rear curtain with light completes the enclosure. As a general rule good quality soap and water will clean the windows in the curtains. Should they become soiled with grease, kerosene or naphtha may be used. Avoid the use of benzene, acetone or lacquer thinners, as they will soften the surface and make the windows opaque. Many spray type window glass cleaners contain some of these ingredients, so avoid their use. Rubbing the windows with a dry cloth will build up an electrostatic charge which will cause dust to cling to the surface. Such a charge may be dissipated by blotting the window surface with a clean, damp chamois. After cleaning apply a liberal coating of automobile or furniture wax as a protection against dirt. First select the front top bow assembly parts. The two side bows are offset at the lower ends and eyes are located near the top curved ends. The centre connecting bow has an eye located at the centre. Assemble the centre bow in the two side bows, with the eyes extending toward the windshield and mount the assembly in the body sockets. The doors are supported at the top and bottom with hinge support brackets which are not interchangeable as they are made in rights and lefts. Select the upper brackets which are made as clamps; the large jaws are formed to span the windshield support and the small jaws to form the door hinge socket. Select a set of jaws (one having a clamp stud) which will assemble with the hinge socket vertical and in line with the bracket mounted on the body below. Also select the correct upper side rail (a rod approximately 30” long with one end curved) which will assemble with the curved end next to the windshield with the curve extending up and out and with the welded eye extending in. After selecting the correct parts install the clamp bracket, with the stud extending in and place the eye in the curved end of the side rail over the stud on the inside of the clamp bracket. Tighten the stud nut with the clamp bracket positioned so the side rail is level with the top of the windshield. Attach the rear end of the side rail to the eye on the top bow with the bolt lockwasher and nut provided. Make the same assembly on the opposite side. Next install the attaching side curtains which carry the door latches. The right and left sides may be easily selected as the lap of the seam goes inside. Place the upper end of the rod in the curtain through the eye mounted on the side rail and attach the lower end at the holes provided in the body. Place the bolt heads on top. Place the top deck covering over the top bow and attach the front end on the fasteners across the top of the windshield. Fasten the covering to the top bow with the two outer flaps. Hook one end of the centre supporting brace in the eye at the top centre of the windshield frame and make the covering taut by hooking the rear end in the top bow eye. Fasten the centre top attaching flap over the rear end of the supporting brace. Snap the door jambs, which are part of the top covering, around the side rails at the top of the door openings. Install the doors and attach the front sides to the body and windshield supports. It is necessary to open the windshield to button the upper fasteners. Attach the rear curtain, pulling the holding straps at the bottom taut only. Assemble the centre section of the rear top bow between the side sections and install the assembly in the body sockets. Place the top over the bow and fasten the front end to the rear of the front top. The side curtains are made for the right and left sides, but when correctly installed the straps are at the bottom and on the inside and the cutout corners are placed at the upper rear. Install both the side and rear curtains. Attach and pull down the straps taut only. 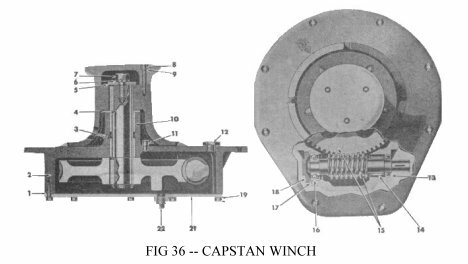 The capstan winch is designed for 5000 lb. Pull, using either ¾” or 1” manila rope. The worm gears have a ratio of 75 to 1 which provides a rope speed of 19 feet per minute with an engine speed of 1200 rpm. A shift lever is mounted on the assembly for engagement control. Engage the drive with the engine idling only and without load: limit the engine speed to 1200 rpm. Lubrication is important because the parts must withstand high pressures when operating at maximum pull. Filler and drain plugs are provided in the gear housing with an oil level stick on the filler plug. The oil capacity is one quart of SAE 90 gear oil in Summer and SAE 80 in Winter. Change the oil twice each year – in Fall and Spring. Hydraulic fitting No. 3, Fig. 36, is provided to lubricate the capstan spindle, the position of which is indicated by the arrow cast on the gear box. To lubricate the spindle, align the opening in the capstan with arrow. Use chassis lubricant to lubricate the spindle, also lubricate the rope roller at each end and the shift rail and the drive shaft bushing in the winch drive support bracket mounted on the front of the engine. Use an oil can to lubricate the winch drive universal joints. A cotter pin is used to pin the winch drive shaft to the universal joint at the engine end and acts as a shear pin to prevent overloading. Should this pin shear off, be sure to replace it with a cotter pin of the same size. Do not replace it with a solid pin or drill the hole oversize for a larger pin. The best performance of a four-wheel drive vehicle is achieved when the load is equally distributed for traction on the front and rear wheels. This equal distribution is disturbed when the vehicle is used for draw bar work because the load on the rear wheels is increased and that on the front wheels decreased. The addition of a 265-pound front bumper weight equalizes this load. When the load is equalized the front and rear axles do approximately the same work which results in an equal and prolonged life of these parts and more satisfactory vehicle performance. The bumper weight Fig. 37 is held in place by four bolts and is provided with hand holes for lifting. Do not add sand bags or other weights in the vehicle. When driving over rough terrain, with the bumper weight in place, the driver should exercise due care.